Your store page is a digital welcome mat for customers. It is your chance to connect with potential buyers, demonstrate your expertise and passion for products that you sell. If you’re new to selling online, it can feel confusing to figure out how to create a top-notch online store. This article contains step-by-step instructions as well as best practice recommendations. 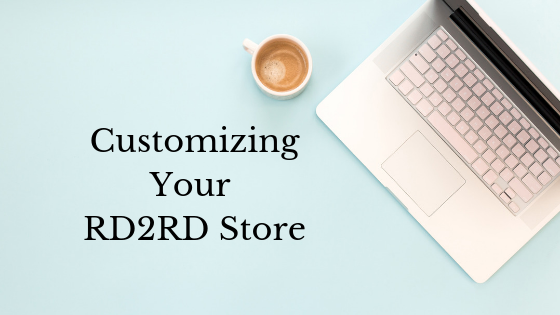 Get your RD2RD store optimized and ready to start earning. What is a store page? Your store on RD2RD is a specific page/URL showing all your products. In addition to a complete product list, it features an image, bio, link to your website, and email contact form. Think of it as a digital storefront. In the image below you can see the anatomy of an RD2RD store page. Here are a few examples of vendors with top notch store pages. Why customize your store page? When shopping online, customers research products and sellers before purchasing. RD2RD makes it easy for customers to learn more about sellers. A detailed vendor profile is shown to customers. Reading about vendors helps customers decide which seller to purchase from. At the bottom of each listing is customer are shown your vendor profile image, bio and a link to view all your product listings. This “view all downloads” link takes customers to your store page. From your store page, customers can also use the vendor contact form to email you with questions about existing products. In some cases they may also request new products that you haven’t yet created. By taking the time to update your profile with an image and biography, you will provide customers with information to help sell your products. Your store page is your digital storefront. While customers can visit RD2RD, search and find resources from multiple sellers, your store page features only your products. You can easily link directly to your store page from your website, social media or in emails. This is an excellent way to market your products. The next time you see a “does anyone have a handout on ___?” you can quickly share a link to your store. What does a completed vendor profile look like? Below is an example of what potential customers are shown before and after updating your vendor profile. Your profile includes your store name, image (picture or logo), a bio and a link to your website (if you have one). Note that without a completed vendor profile, the area appears blank. This leaves potential customers without needed information to purchase your products and will decrease your sales. Choose a high-quality photo or your brand logo. Don’t be afraid to use an image that includes some personality. Think about consistency across other platforms. 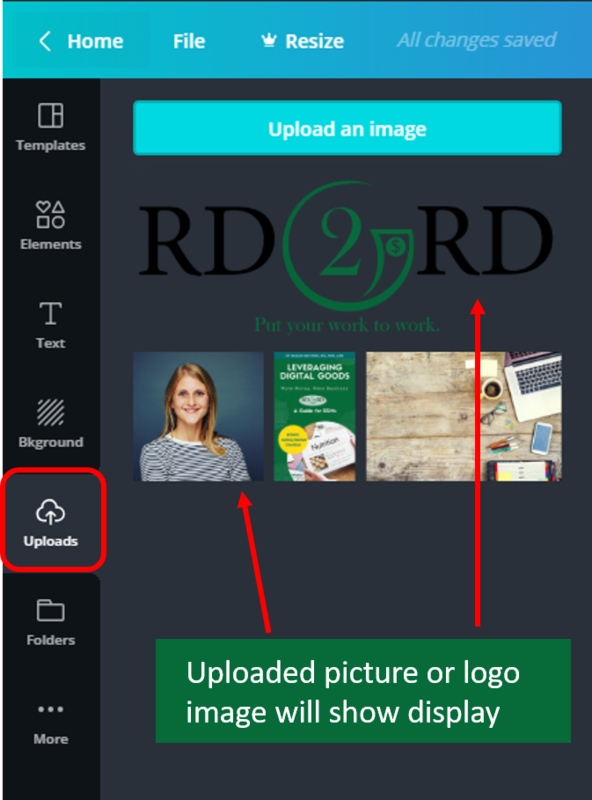 You can use the same image for your RD2RD store page that you use on social media. If you’re looking for inspiration, browse a few other RD2RD stores or sites like Etsy. You’ll find many great examples. Your store bio should be engaging for potential customers to read. Think about how you can establish credibility surrounding your store niche and convey how your products help others. Avoid an overly formal bio that focuses on your educational and work experience. Keep it brief and make sure it has attention grabbing elements to win and keep the attention of customers. If you’re looking for a little help getting started, try this structure. Hello, I’m _____. I create tools and resources to help _____. My background and passion developed from _____. What stands out about my products is ____. Thanks for checking out my store on RD2RD. There are 2 easy ways to obtain the link to your store page. Login to the vendor dashboard with your username (email) and password. From the dashboard home page, you can access your store page. Just below the welcome message, you will see your store URL listed. Copy and paste this link to share your store with others. To preview your store page, click the link and it will open in a browser window. From the RD2RD homepage, use the search bar or category buttons to navigate to one of your product listings. Scroll to the bottom of the listing and click the link to view all downloads below your image and bio. When viewing any product on RD2RD, click the link to view all downloads by the vendor. The store page is shown with a complete listing of products as well as detailed bio, link to website and profile image. The vendor dashboard is your hub for all store management tasks. 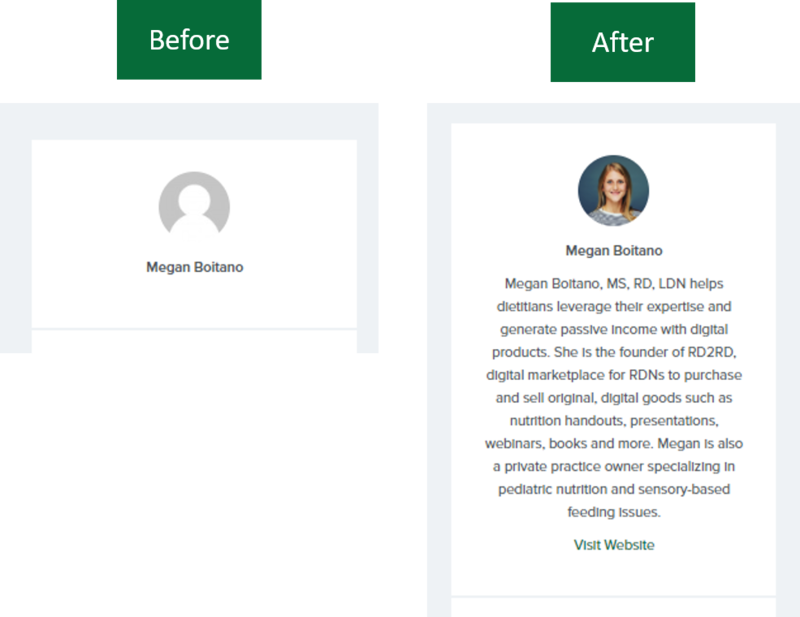 Follow these step-by-step instructions to personalize your store page with a bio and profile image. 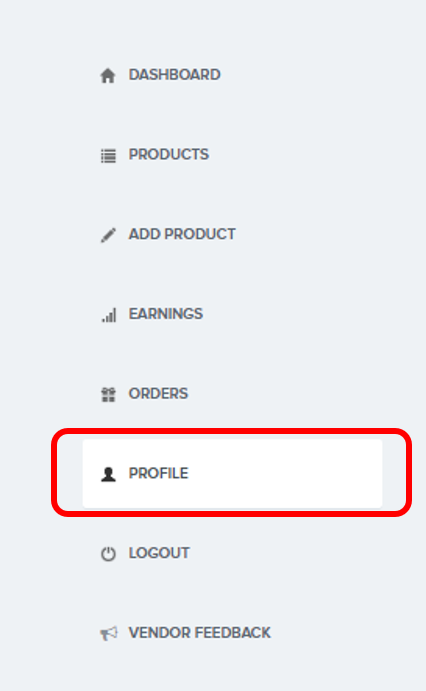 In the profile section, you can update important information associated with your vendor account. Your store bio and profile image are two key elements to add after registering as a vendor. Use the profile section to change your store name and add your website address if you have one. 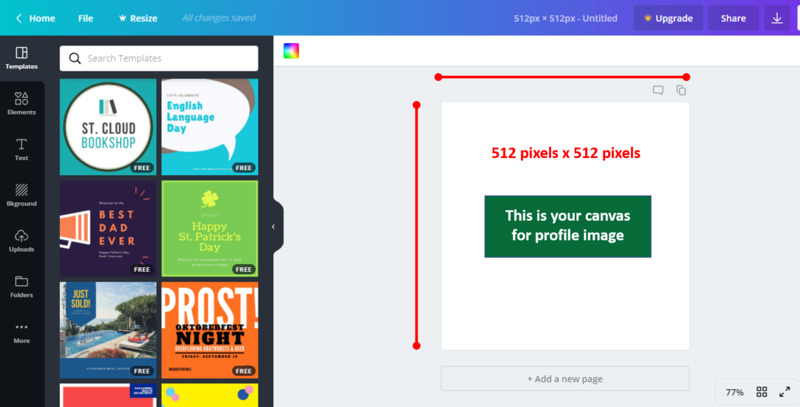 Follow the step-by-step instructions below to create a profile image that is optimally sized and add your store bio. This must be a square image no larger than 512 pixels high by 512 pixels wide. An image that is incorrectly sized will appear distorted or blurry. Give your store and products a professional appearance by having a high-quality profile image. One of the most common mistakes vendors make it using an image that isn’t sized correctly. This is especially common when a logo is chosen. Only a small portion of logo is shown. If you want to use your logo for store image, follow this step-by-step guide using your logo instead of a picture. You don’t need to be a graphic designer or have expensive software to create appealing and correctly sized images. 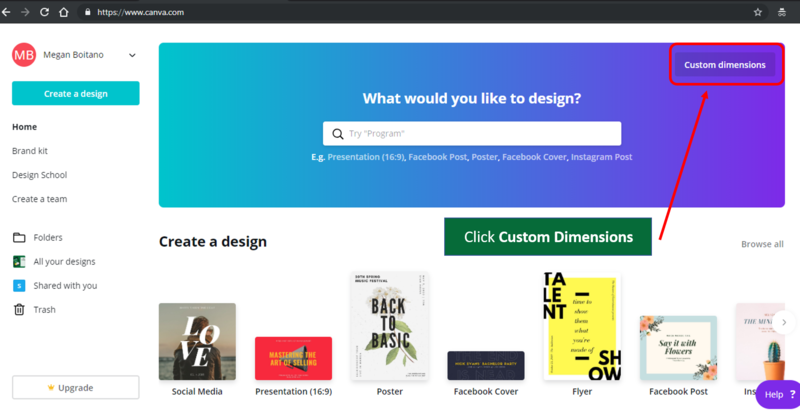 Canva® is a free design program you can use to create graphics using a photo, existing logo or design your own from scratch using their intuitive, drag and drop interface. Create an image for your store even if you are planning a new logo or professional photos. 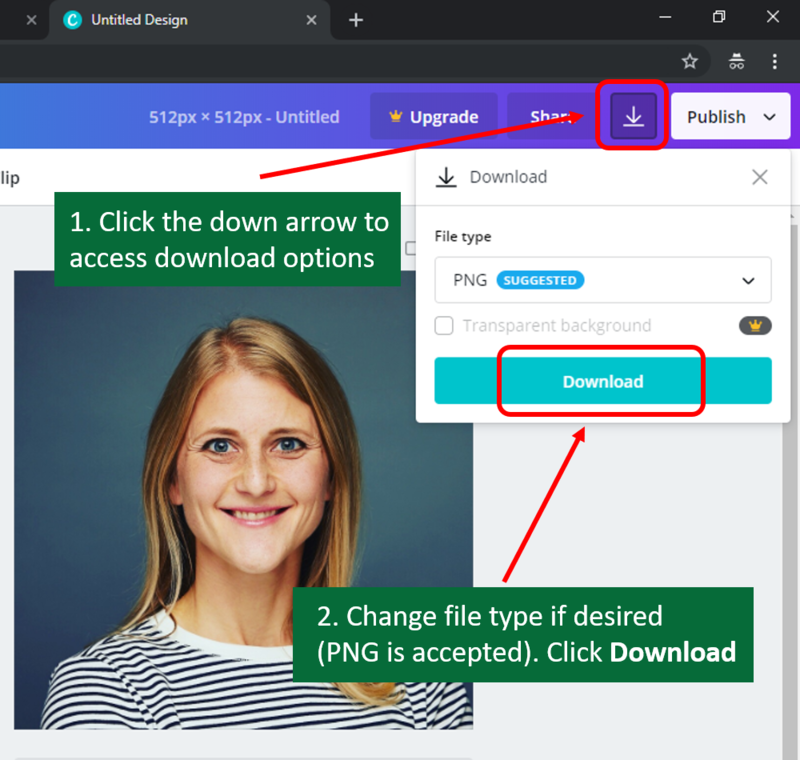 You can update your profile image at any time. 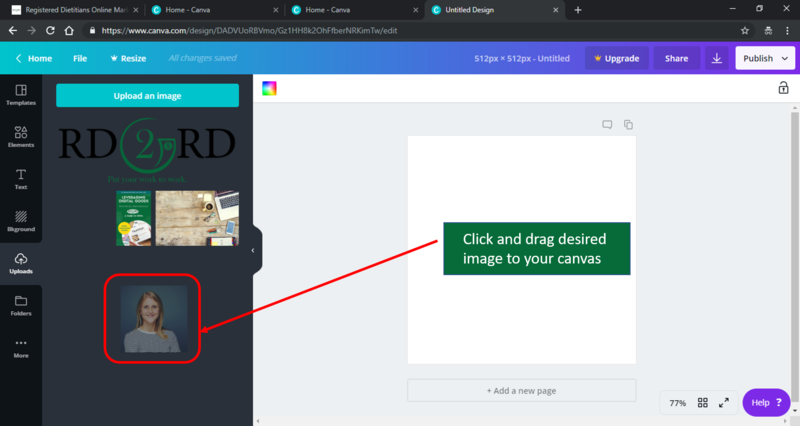 Step 1: From you Canva account home screen, click “Custom Dimensions in the upper right. Step 2: Choose “px” as the measurement (not inches) and enter 512 in both height and width boxes. 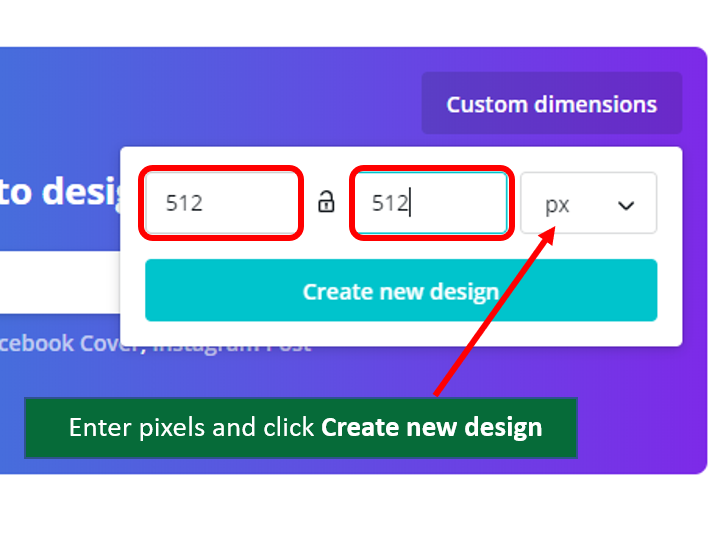 Click “Create New Design” when finished. Your custom sized canvas will be shown and ready for design. 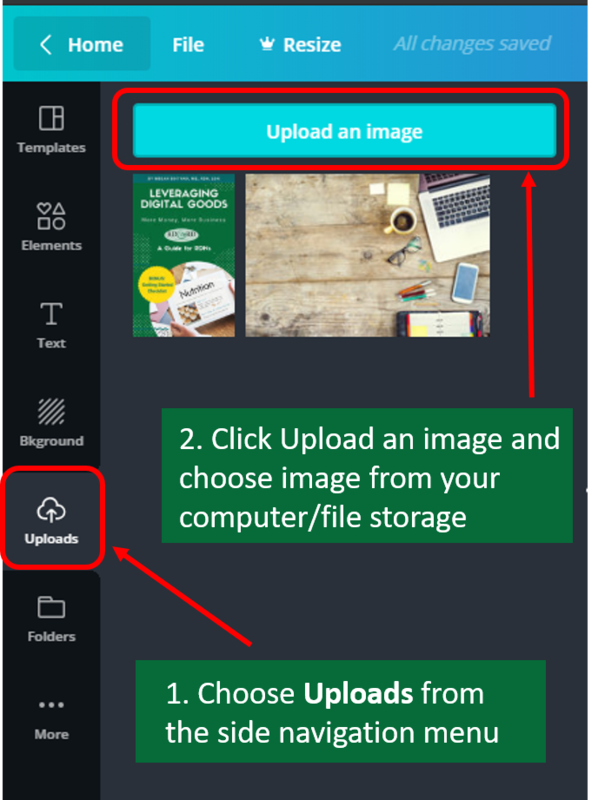 Step 2: Click “Upload an image” button and choose image file from your files. Step 4: Click and drag corner to adjust size. Click done to save changes. 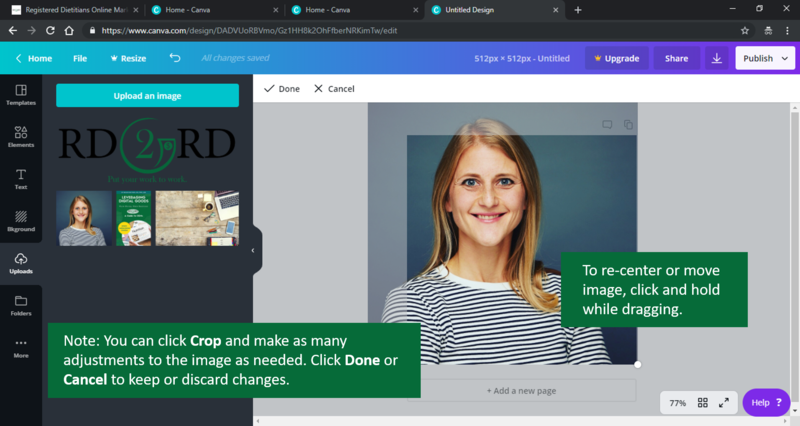 Step 5: Re-position your image by clicking and dragging. Position and then release. Congratulations on creating a profile image for your store page. Now you can update your profile in your RD2RD Vendor Dashboard with this image. Step 6: From the media library tab, click file to select. Note check mark appears. Congratulations! You have successfully updated your RD2RD store with a profile image. Now on to adding your bio. The information you include in the “About” section of your vendor profile is displayed on your product pages as well as your store page. Don’t overlook adding a strong bio to help boost customer confidence and sales. Step 2: Scroll down to “About” section and type your bio. You can also copy/paste text. Now that your store has a profile image and bio, it’s time to check out your work. View your store page as it will be viewed by customers. Visit your store page URL. Remember, you can obtain your store URL from the vendor dashboard homepage just under the welcome message. Share your store page on social media, with colleagues and clients or add a link on your website. Updating your vendor profile creates a vendor store page customized with an image and bio that reflects your unique personality and brand. 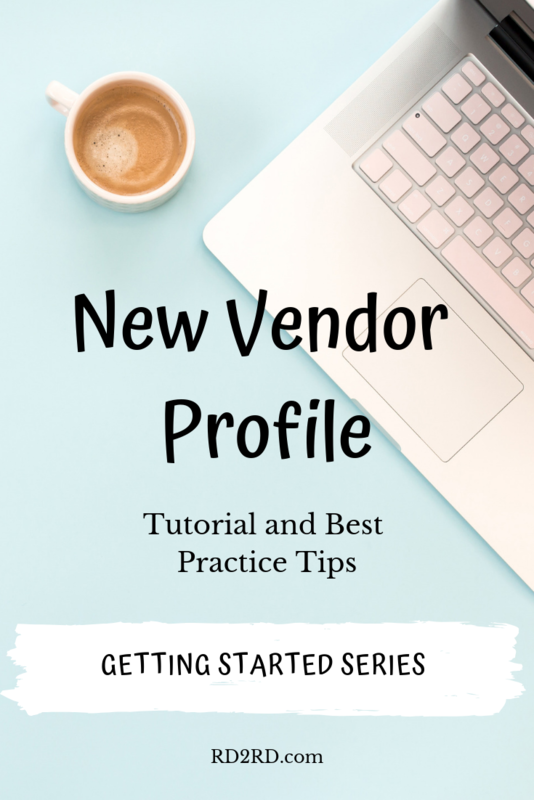 Your vendor profile serves a tool for customers to learn more about you, drive interest in your products and create confidence about your expertise. Keep your profile up-to-date to be sure that it reflects your store contents. You can visit the vendor dashboard anytime to make changes. 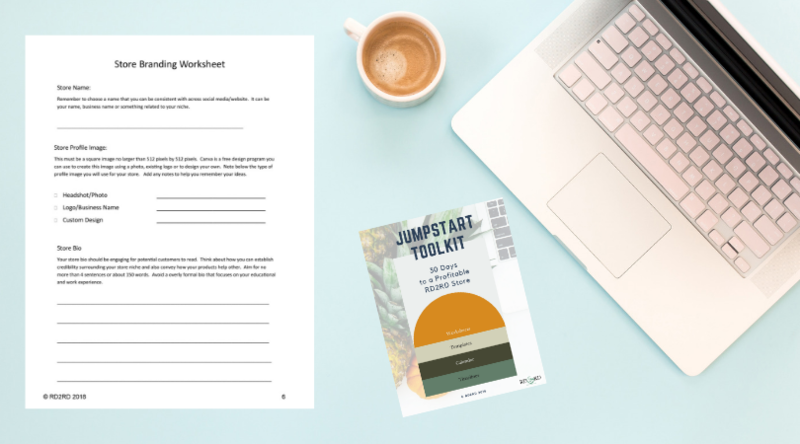 Grab the Jumpstart Toolkit and you’ll receive a Store Branding Worksheet. Use this 8 page resource with calendar, task lists, worksheets and templates to launch your profitable store quickly. Enter your information below to receive your copy! The opportunity to share your expertise with a group can be both exciting and create apprehension. What will I present about? How will I keep the group engaged? Do I have time to put the needed resources together? From corporate/workplace wellness, schools, community groups, health fairs and events, registered dietitians provide group nutrition education in many settings. This article provides tips and resource recommendations for group nutrition education. From links to presentations, activity guides and complete toolkits, you’ll find inspiration and confidence for your next group event. Getting asked to speak to a group about nutrition means creating an outline for your presentation as well as pulling together resources. Before choosing a topic or creating content, take time to gather information. Will you have access to audio visual equipment? What types of activities or topics have been successful with this group before? What is the age and demographics of the group? Gathering information about the audience will help you to create a presentation that is valuable and relevant. If you do utilize a slide-based presentation, build in interactive elements. Use a quiz to ask the audience their thoughts before covering a specific topic. Consider creating a worksheet that attendees complete during the presentation with key points and their takeaways. Include stories or other real-world examples that help to keep the topic relevant. There are many presentations available from RD2RD. These “done-for-you” tools can be used as is, or modified to fit your specific needs. Many include interactive elements. Browse all presentations for even more options to fit your needs. Cover the basics of nutrition with a Nutrition 101-style presentation. This modifiable 17-slide presentation includes essential nutrients as well as how to identify reputable information. It includes a goal sheet to help attendees set intentions during the presentation. For a more comprehensive look at nutrition that would be well suited for a health-conscious group, consider Beyond Broccoli: Best Foods for Health presentation. It includes details about the new food label, gluten and more. Is your audience keen to learn basics of meal planning and meal prep to save both time and money? Introduce the basics and more with this 64-slide presentation, Getting Started with Meal Planning and Meal Prep. Also a great tool if you offer paid meal plans to communicate the value of the service. Take a deep dive into the topic of reading food labels. The current food label and claims made on packaging are complex. This 55-slide presentation, Nutrition Labeling: What You Really Need to Know, dispels myths and provides clear information to understand the food label and use it effectively for informed choices. Looking for a trendy topic? What’s the Big Deal About Gluten is a 38-slide presentation that also includes a quiz to go over with attendees to ensure understanding of key concepts. For a highly visually appealing presentation, this 16-slide presentation, Gluten Friend or Foe is a perfect fit. For a fitness focused group, this 30-slide general nutrition presentation, Nutrition Basics for Peak Performance covers the essentials. If you want to go beyond nutrition and utilize your fitness credential, the Fitness Myths and Training Truths is engaging, interactive and includes a comprehensive presenter’s guide. 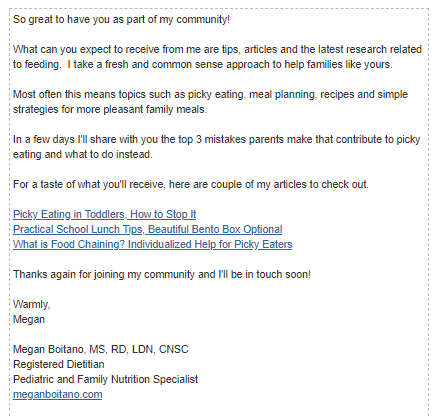 Need a basic presentation about pediatric nutrition? Balanced Eating for Children and Nutrient Needs for Growth is a 33-slide presentation that discusses portion sizes, cutting back on sugar as well as nutrient deficiencies and supplements. An engaging, learning activity for children can provide valuable nutrition education. Using a hands-on approach with an age-appropriate concept is key to success. There are many ready-made tools and guides available. You don’t need to develop your own curriculum from scratch. Browse the resources available and choose a tool suited to the age and location of your event. The Kid’s Corner is part of Nutrition.gov, a USDA-sponsored website. You’ll find an array of credible resources as well as activity ideas and downloads. Some excellent options are food critic and grocery store bingo. For a family-friendly activity, the National Heart Lung and Blood Institute (NHLBI) has the Go, Slow, Whoa curriculum. It focuses on helping families recognize foods that are better choices for a healthy body. A complete 70 minute activity with handouts, songs and activities is included. Even a simple coloring page for young children can be a valuable tool to engage and talk about good for my body nutrients. These printable characters of fruits and vegetables ABCs are also an excellent teaching tool. From playing a simple game of identifying letters and colors to naming the pictured food, these visually-appealing printables provide a variety of options for nutrition activities. Also available as posters. Engage in a discussion about the five senses with this worksheet. Use a small assortment of foods and help kids make guesses about foods using sensory elements such as taste, smell and vision. Use blindfold or boxes to make this activity have even more appeal for curious young minds. For some inspiration for fun events and activities, the Food and Nutrition Service of the USDA has a booklet of ideas. From a food scavenger hunt to a cooking competition, this booklet contains ideas and printable resources needed for the event. The Eat Like a Superhero toolkit teaches kids to power their bodies with healthy choices. This comprehensive 35-page education kit includes all the tools you need from table tents to handouts and food picture cards. Looking for a garden-friendly activity for use at school or farmer’s market? This Children’s Harvest activity includes 8 different vegetables, fruits and herbs. The focus is on nutrients each provides, taste, smell and how each can be used in recipes. Teach kids and parents how to pack a healthy lunch with Lunchbox Lessons. This activity is perfect for groups that require a kid-friendly activity. Kids get involved with cutting and pasting items to create a healthy lunchbox. The included lunchbox checklist is a perfect takeaway for parents. For a creative approach, this doodle note combines education with an artistic element. Teach about the various edible parts of a plant while kids color the parts according to the lesson. Includes discussion points as well as an answer key. 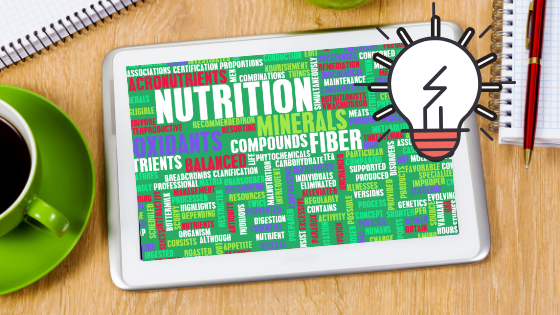 For middle-schoolers (5-6th grade), these nutrient knowledge flash cards can be a great classroom activity. Pair kids up or work in small groups to get the entire class participating. Tackle the topic of sugar-sweetened beverages. This Sugar Wars, Become a Sugar Jedi toolkit helps kids discover the amount of sugar in commonly consumed drinks. The education kit includes vocabulary cards, drink labels, estimation, calculation, and graphing activities. It also features a bonus, matching game. Teach the 6 classes of nutrients with a twist. This doodle note allows learners to individualize their experience while gaining understanding of how nutrients work in the body. This doodle approach is a good fit for both kids and adults. Sports Nutrition For the Student Athlete is a 25-slide presentation ideal for those that want to learn to fuel for the big game. Includes an icebreaker and is designed to foster conversation and questions, but also have a structure for learning. A handout is available to provide to students. If you’ve decided to participate with a table or booth at a local event, including a nutrition activity is a smart choice. It draws traffic to your business and creates a fun environment to spark conversation and create potential leads. Choose an activity that resonates with the target audience. From a cooking demo to an interactive, build a balanced plate display or guess the portion size, choose an activity that will appeal to attendees and match your expertise. Be sure to have a convenient way for attendees to sign-up to receive more information from you after the event. 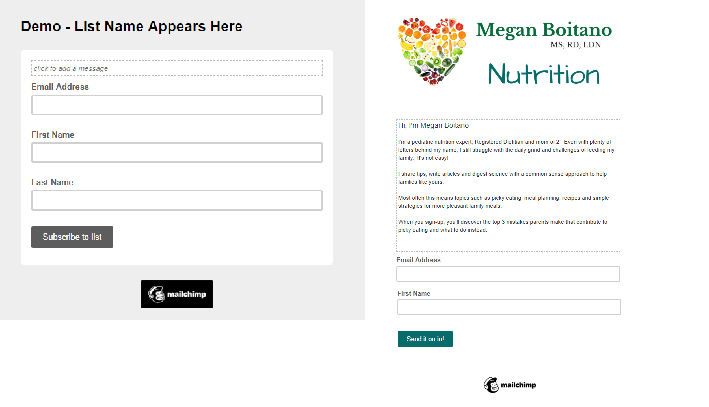 This could be as simple as a paper signup sheet to receive your newsletter or a tablet for electronic entry. This comprehensive Health Fair Toolkit includes all the tools you need for a successful table and event. Includes a test your knowledge activity to engage attendees. From a tip sheet to a supply checklist and email list signup sheet, you’ll be confident and organized. Use this Visual Guide to Portion Sizes to engage attendees in conversation about making healthy choices. Have food and/or food labels available to use as part of the discussion. 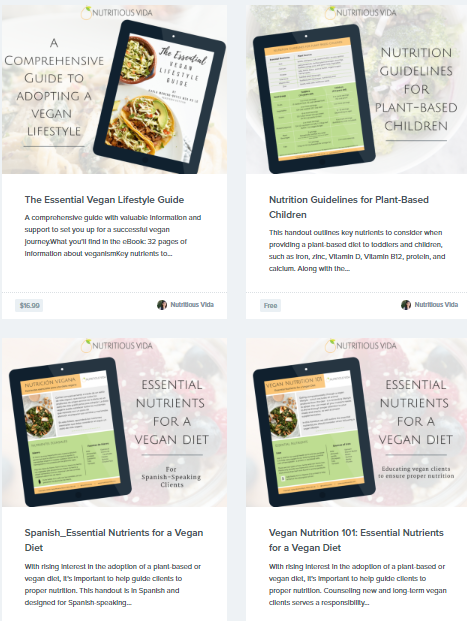 Focus on encouraging plant-based nutrition with this visually appealing 2-page resource. 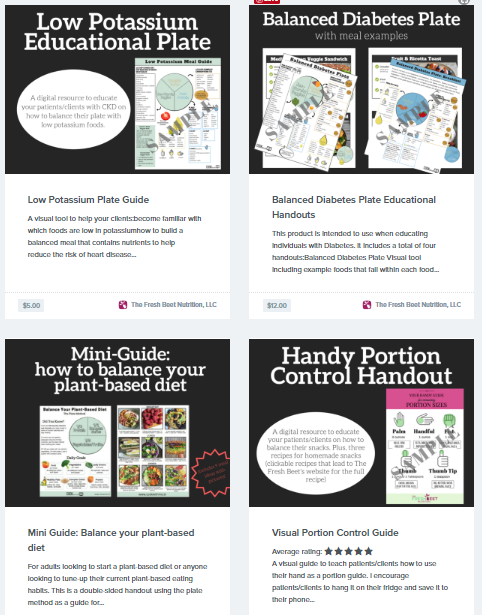 Help attendees understand how to create a balanced plate with the Balance Your Plant-Based Diet Mini-Guide. Use the Build a Healthy Salad resource to help attendees create well-balanced salad when using a salad bar. Pair with the Healthy Sandwich Tips and Recipes for a workplace lunch focus. 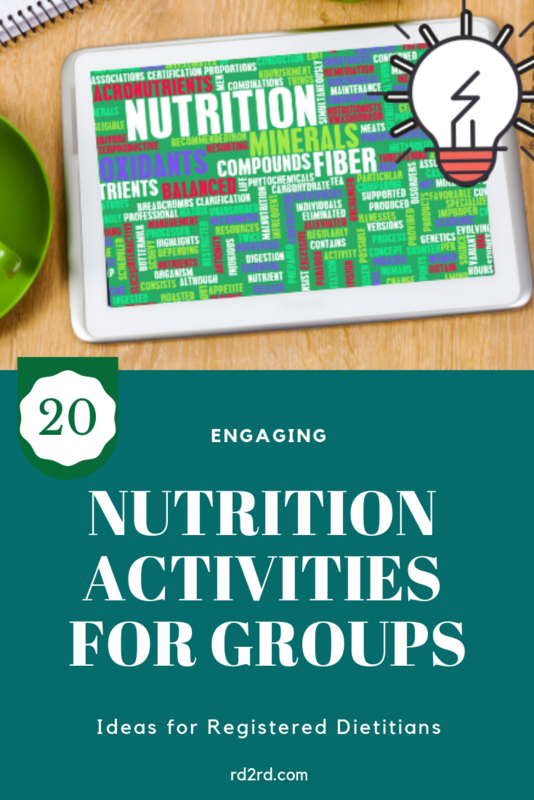 Group event and activities are an important way that Registered Dietitians communicate nutrition messages. It also is an excellent way to demonstrate our expertise. RD2RD features a wide-variety of nutrition resources. Choose a done for you presentation, toolkit or use available tools to customize to meet your needs. Sales tax for digital products is a dynamic and in many cases, confusing topic for online sellers. Understanding the basics can help you to determine when to collect sales tax to be compliant with tax laws. This guide will help to provide a foundation for RD2RD vendors regarding sales tax. In addition to answering common questions and providing links to resources, it will show you how to obtain customer order details from your vendor dashboard. Take a deep breath. The topic of sales tax can feel daunting, especially when you’re talking about digital products. Digital products are much different than physical products. For example, think about the difference between selling a traditional book versus an ebook. One is tangible property while the other is a digital download. What about an ebook rental or subscription service? Part of the challenge with sales tax for digital products is that the rules and laws don’t reflect how modern eCommerce works. Rules used for catalog sales are often the basis for determining digital product taxability. However, this is changing. There is a considerable amount of action being taken by states regarding sales tax for online sales including digital products. If you’re not familiar with the terms, economic nexus and remote sellers, they should now be on your radar. The primary reason for these changes is that as consumers have moved to shopping online, sales tax revenue from brick and mortar stores has decreased. Updating tax law helps states capture more in sales tax revenue and make sure that both sellers and customers are treated more fairly. You need to be paying attention to changes in tax laws that impact you. Researching the topic of sales tax online is an excellent way to better understand the basics, but isn’t a substitution for the expertise of a tax professional. Be sure to discuss your specific situation with a knowledgeable expert. Explained in simple terms, your nexus is the state(s) that your business has a connection to. For example, maybe you have offices in two different states or an employee in another state. A detailed explanation of sales tax nexus can be found here. If you have a nexus in a state, you may need to collect sales tax for purchases made by customers in that state. You may need to contact the tax authority for each state (often called the Department of Revenue) to confirm if you have a nexus. Each state sets their own rules in regards to sales tax including nexus, required registration/permits and which products are taxable. Are you still with me? Don’t stop now. This topic will get a lot less muddy when you just dig in and think about your specific situation. The answer depends. 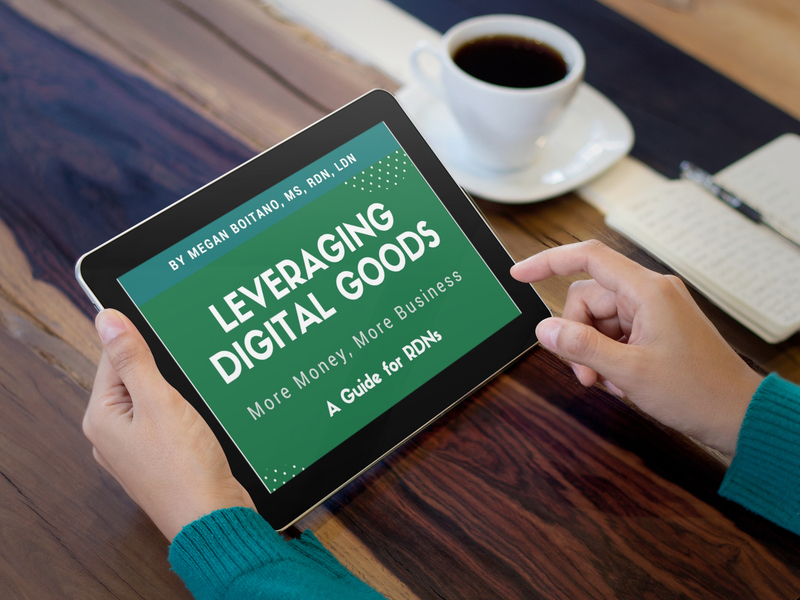 About 65% of states have some definition of digital goods for sales tax purposes. Once you’ve determined your sales tax nexus, the next step is to determine the specific rules for sales tax for the products you sell. Some states have no sales tax, don’t tax digital products, have a specific definition digital products for tax purposes or apply rules for other taxable items. This detailed article from TaxJar gives an excellent overview of the topic and specifically lists state-by-state resources. To keep from getting caught up in confusion, stay focused on the specific digital products that you sell and determine if it is taxable in your nexus. The examples below are simplified and for demonstration purposes only. A tax professional experienced in ecommerce could provide you with specific details about your requirements. Example 1: Let’s assume that you live and operate your business in Oregon. You have no nexus in any other state. Oregon is one of the six states that has no sales tax (physical or digital goods). This would mean that you have no requirement for sales tax for your digital product sales. Example 2: You live and operate your business in California. You have no nexus in any other state. California has sales tax, but digital products are exempt from sales tax. 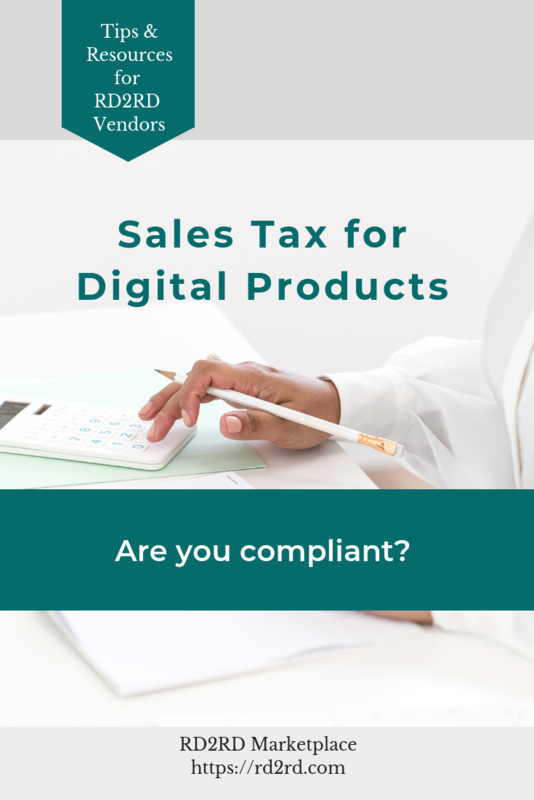 This would mean that you have no requirement for sales tax for your digital product sales. Example 3: You live in Washington state. You have no nexus in any other state. Washington has sales tax and digital products are subject to sales tax (including downloaded, streaming and subscription). This would mean that you have a requirement to collect and remit sales tax for purchases made by customers in Washington state. Example 4: You live in Washington state and also have an office/employees in California. Your business has a nexus in two states. For digital products, you would have a requirement to collect and remit sales tax for purchases made by customers in Washington, but not for customers in California . As you can see from these examples, sales tax can be complicated. When you take things step-by-step and apply the basic concepts to your specific business and products, you can get on top of this important aspect of selling online. If you are a sell digital products on a marketplace like RD2RD, you should be paying close attention to changes in rules for remote sellers. Specifically, new rules in regards to economic nexus. A landmark Supreme Court case (South Dakota vs Wayfair) was decided in 2018 in favor of the states ability to collect sales tax from remote sellers. Other states have quickly followed up with changes to their tax rules. This is an excellent resource describing remote seller concept. To get into the details about state-by-state requirements, this resource offers a clickable table. How do I collect and remit sales tax for digital product? Determining which customers to tax and for which products is only part of the challenge with sales tax for digital products. When necessary, sales tax is collected from the purchaser at checkout. Typically, most ecommerce tools have sales tax setting. You can specify which products are taxable and the rate to charge customers based on their location. Check with each states’ tax authority (often the Department of Revenue) to determine if there is a specific threshold for sales ($ or number) and how to apply/register for a sales tax permit. You don’t want to be collecting sales tax without a permit to do so. When pricing your products, you also must choose if you will select a price that includes tax or if tax will be added. The simplest approach is to use inclusive pricing. All customers are charged the same amount. However, this does mean there will be an impact on your product margin for sales. In practical terms, an inclusive pricing approach means that you will be deducting sales tax from the profit you earn on your products. 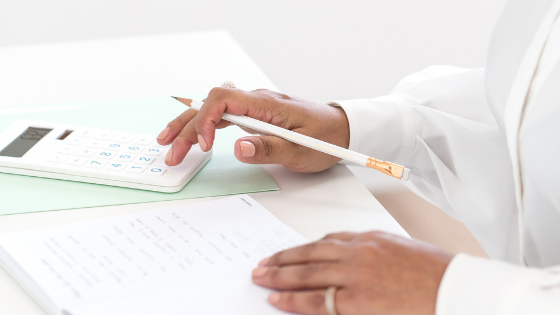 Many sellers utilize reports generated monthly to determine which sales were subject to tax. With an exclusive pricing, the tax calculation is conducted at the time of checkout and applied to the purchase. Customers will pay a different final price for the product depending on if sales tax was applied and the specific rate in their state/municipality. There are tools designed to make collecting and remitting sales tax easier. Automation of sales tax collection is a wise decision for online sellers of digital products. For example, TaxJar is a software tool that ensures that you are collecting the correct amount of sales tax from customers. It has a comprehensive database of locations and tax rates. You can utilize TaxJar at the time of checkout or upload transaction information regularly to determine your sales tax due. In addition to ensuring correct calculation of sales tax rate for transactions, many automation tools offer a service that submits your sales tax payments to states as needed. If you sell on multiple marketplaces as well as your own website, having all the information in a single location can help you stay organized. There are a number of options for sales tax automation including Taxjar, Taxify.co, and Avalara. Does RD2RD Collect Sales Tax for Vendors? RD2RD is a marketplace facilitator. In some states, marketplaces are being required to collect and remit sales tax on behalf of sellers. However, for most states, this requirement doesn’t take effect until a specific sales volume (i.e. $250,000 annual sales). Currently, RD2RD doesn’t meet the threshold to be required to collect and remit sales tax on behalf of vendors. The terms of service describes this in more detail. What tools does RD2RD have to help me with taxes? Your vendor dashboard is your one-stop resource to review your sales/earning history and customer details. In the order history tab of the vendor dashboard, you can review customer details for each sale. This includes customer address information. The location of the purchaser/buyer is essential to determine if sale is subject to sales tax (based on your nexus). What about sales in other countries, like value added tax (VAT) in Canada and the EU? RD2RD currently allows sales in Australia, Canada the United States as well as U.S. Virgin Islands. You should review the rules related to sales tax in these countries as well. While sales tax probably isn’t the most exciting topic, it is an essential aspect of selling online. Take time to research and review the resources shared to better understand this topic. However, they are not a substitute for a tax professional experienced in sales tax. 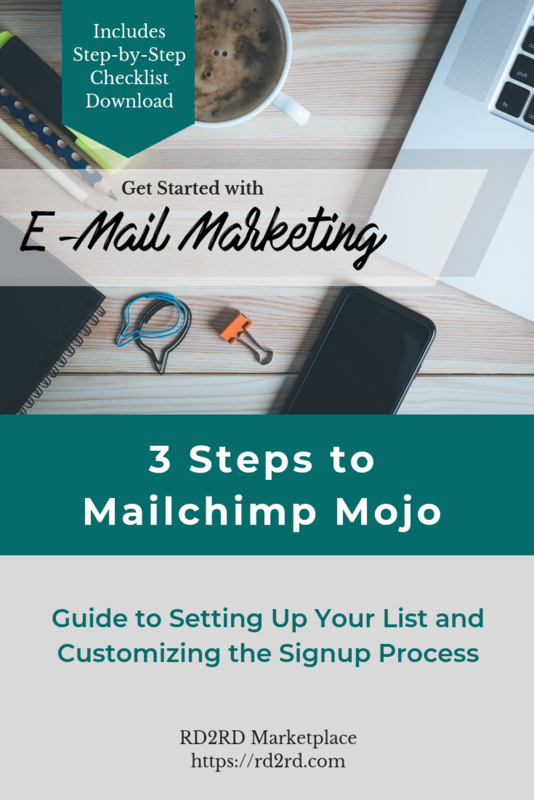 Get a little Mailchimp mojo and you might be surprised at how much you like email marketing. Learn how to get your list setup, signup process customized and a welcome email on autopilot. Using step-by-step tutorial approach and video demo in this article and you’ll be confident and ready to start growing your email list. Choosing an email service provider for your business can be confusing. There are many options to choose from and the array of features can be dizzying. Besides the fact that Mailchimp is free for your first 2000 subscribers, it also contains essential features such as the ability to send automated email campaigns, create groups, tags and segments as well as create landing pages. You will find that the free version of Mailchimp will provide more functionality than you can likely master early on. Another benefit of Mailchimp is that because it is very popular, most tools you will need to run your business will easily integrate. From plugins and other software solutions you select for your business, easy integration with your email service provider is essential. If you develop a strong set of email marketing skills using Mailchimp, they will apply to any email service provider. Before diving into creating campaigns and signing up new subscribers, there are few important tasks to complete. 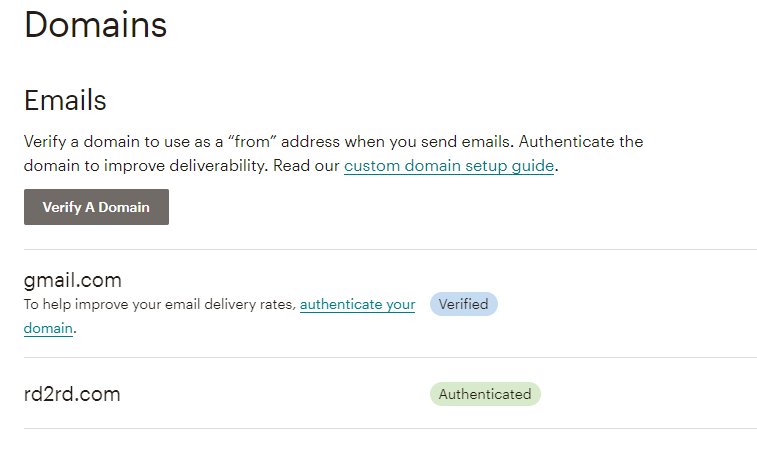 Verify Your Domain – after signing up for an account with Mailchimp, you will receive an email to verify your domain. By clicking the link in the email, your account and email address will be verified. Once your account and email address have been verified, you can send campaigns to subscribers. However, before sending emails, there is an often missed step in the setup process that will be discussed next. Why? Your emails will show from you rather than strange email address, less likely to be directed to SPAM and images will show automatically. More about the benefits here. How? You must add a couple of DNS records with your domain host (where you bought your domain name). 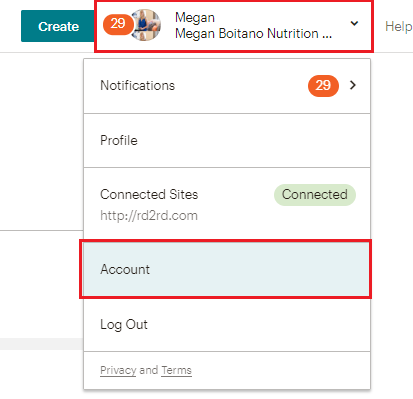 To access your account, click the menu in the upper right hand corner after logging into Mailchimp. From your account page, choose settings, then domains. From the domains area, you will see a list of domains and their status. If you have trouble, call your domain provider’s support and they will help you. You must have a domain specific email address (i.e. @yourdomain.com) not a @gmail.com or @yahoo.com in order to authenticate. Note in the image above that the @gmail.com domain shows as verified and the rd2rd.com domain is authenticated. Emails sent to my list are sent from megan@rd2rd.com. There are two options for adding new subscribers to your email list. The difference between the two is important and should be something you understand as it will have an impact on your list growth and subscriber experience. When you choose double opt-in, new subscribers are sent an email that requires they confirm they want to be added to the email list. This is the “double” element as it is sent after the initial request to be added to your list. With single opt-in, subscribers are added to your email list immediately after providing their email via your sign-up form, landing page or other email capture tool. Which to Choose? Single gets people on your list faster. Double can be easier for GDPR compliance and anti-spam laws in Canada (CASL). A comprehensive comparison is beyond the scope of this article, but you can read more on this topic here. How? To change your list from single to double opt-in (or the reverse), you will access list settings. Once in the list settings area, update the form settings and campaign defaults. Pay attention to the default from name and from email address. These will be included on all the response emails sent to subscribers during the signup process. You want to be sure that they are easily identifiable. If you want to select double opt-in for your list, check the box next to double opt-in. Tip: If you are worried about robots signing up without double opt-in, turn on reCAPTCHA. To enable reCAPTCHA, click the button on the form settings. Why? You don’t want your sign-up process to feel like a robot wrote it. Update the default Mailchimp text and design to match your brand voice and colors, etc. The image below shows a comparison of the default list sign-up form vs one that has been customized. 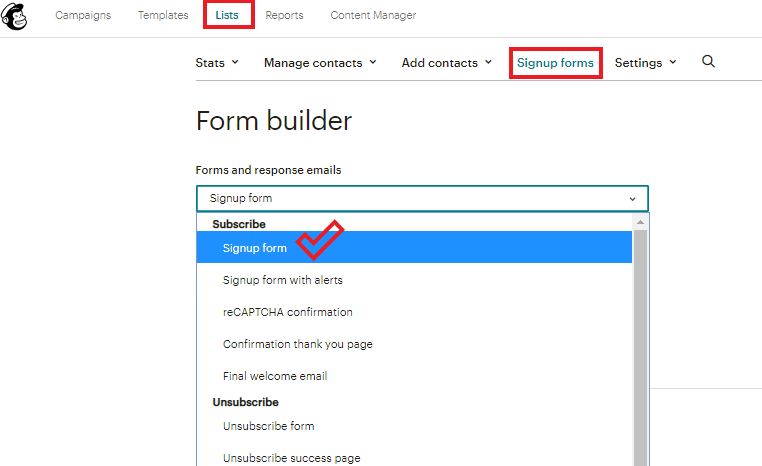 Your list in Mailchimp has a specific URL that displays this sign-up form. Once you have customized this form, you can link to this URL from social media or other posts. 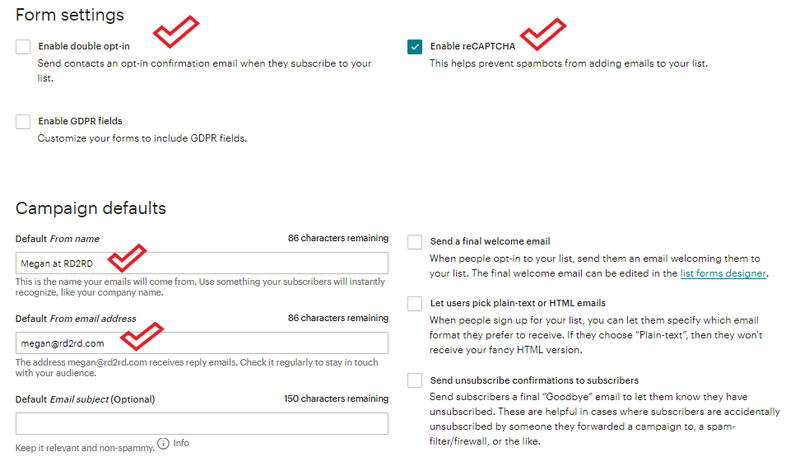 In addition to the signup form, customizing the response emails your subscribers receive after they’ve confirmed their email address or successfully navigated the reCAPTCHA requirement, allow you to add a unique and memorable experience. 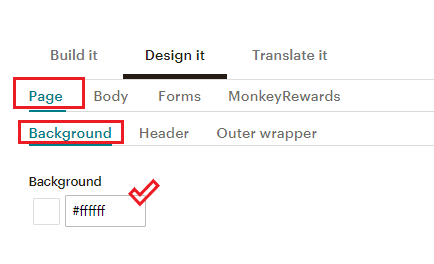 Don’t use the robotic and boring-sounding default language provided by Mailchimp. Additionally, you will want to adjust the colors and fonts to match your brand/website so the signup process feels like a natural extension of your business. To customize the sign-up form, you will use the 3 tabs available, Build it, Design it and Translate it. This article will cover a few basic items, but there are many additional options available. Update the list name text or change to an image. Hover over the existing text and you will see options appear. Next, add a message for subscribers describing the value that your list will provide. Avoid saying “subscribe to my list” as it is unlikely that anyone wants to join you list. You need to give them information about exactly what they will receive and why to provide their email address. Here is an example to consider. 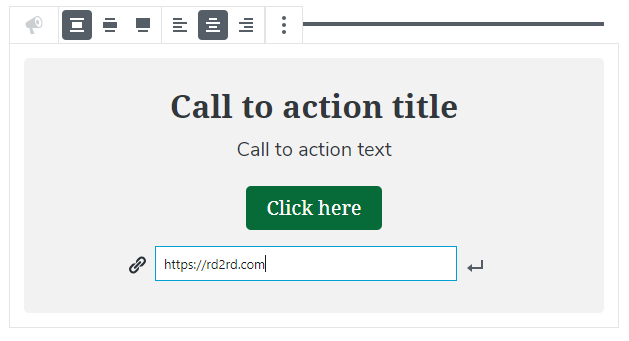 After updating the list name text or replacing with an image and adding a message, the last important consideration on the Build it tab are the fields to include on your sign-up form. You want to make it as easy as possible for subscribers to join your list so avoid requiring any information that isn’t necessary. 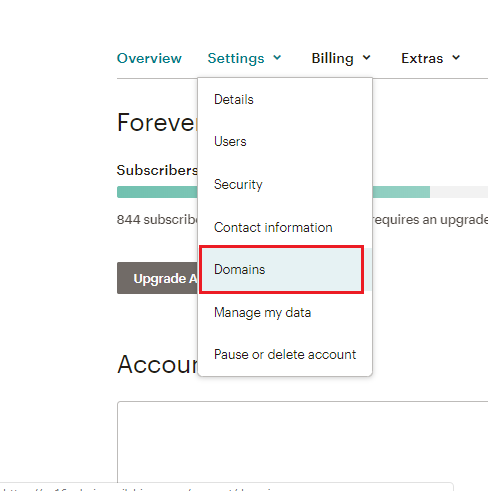 For example, first and last name are added to the signup form by default, but it isn’t necessary to require new subscribers to provide this information. Email is the only required field on your signup form. Hide fields from the signup form rather than deleting them as you may want to include this information about subscribers in your list. You’ll notice that hidden fields show on the build tab, but have a watermark behind with the text “hidden.” If you visit the signup form URL, you will see that hidden fields will not be visible when being viewed by potential subscribers. The next step after making changes to the “Build it” tab is the “Design it” tab. Don’t worry if you’re not completely confident that everything is done correctly. You can always revisit each tab to make additional changes. The “Design it” tab allows you to change nearly every design element of the signup form and response emails. From the background color, font, button color and more, you can create a signup form that is has some serious design style! We’ll touch on a few basics that will give your signup form a great start and you can dive more deeply into the design options if you’d like. First, change the background of the signup form from the drab Mailchimp grey to white or a color that matches your brand. If you’re not sure what color to use, white is easy and always looks great! The next important design element is to choose a default font. You want the font to look similar to the style of font that you use on your website or brand materials. The font can always be overridden if you want to make adjustments. After selecting the font style, you will next update the button color. This is the button that subscribers will click to signup for your list. You can choose both the button background color and the text color. Make sure that it matches your brand colors and that the text color will show up and be easy to read. The last essential element is to update the MonkeyRewards icon that is included with free Mailchimp accounts. The default has a black background and stands out on the signup form. By switching it to the option with the white background, it typically blends in more with your form. The default text for the button on the signup form is “Subscribe to List.” This is incredibly boring and you can do much better. The “Translate it” tab allows you to customize the default text with your own language. This means that you can use your own brand voice and give your signup form some personality. Scroll down near the end of the list of until you find “Subscribe to List.” On the left hand side in the editable text box, change the text. Once you’re satisfied, save the translation settings. Congratulations on customizing your signup form! Now you need to preview the signup form as it will be displayed to subscribers. Make sure that all the elements and design are exactly how you want them. Copy and paste the signup form URL into a browser window and admire your work! 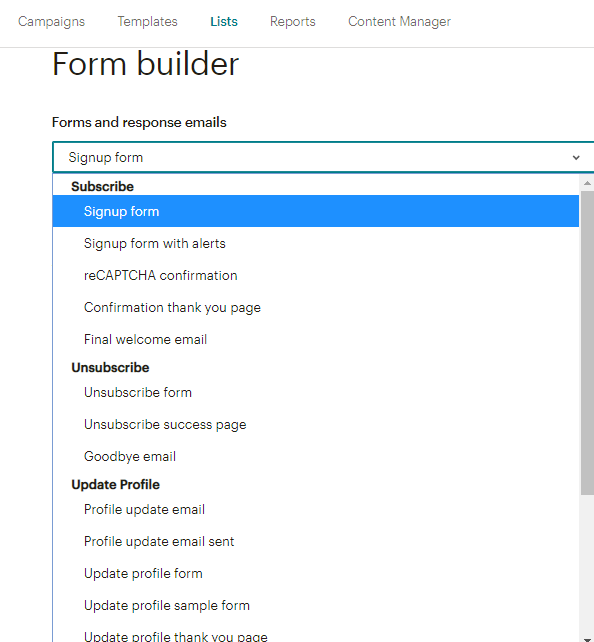 For an example, this is a preview of completed signup form compared with default Mailchimp signup form. Such a huge difference with a few simple changes. After you’ve finished customizing your signup form, next turn your attention to the response emails. It’s important to also update the boring, default text included on these messages to reflect your brand. Depending on if you have selected single or double opt-in for your list, the response emails will be slightly different. There are more in the double opt-in process. The design changes such as background color, font, logo and other design changes you made on the signup form carry over to the response emails. The next section of this article is dedicated to creating the final welcome email. The easiest way to send new subscribers a welcome email is to use the response email in the signup forms area of your list. Another popular way is to use an automated email campaign. A campaign is just a fancy word for an email. Automated email campaigns are sent based on subscriber behavior. Joining your list is a behavior trigger. However, for this example, we will use the simplest option and use the response email to send a welcome email to subscribers. Why bother to send a welcome email? There are a number of reasons including the fact that welcome emails have one of the highest open rates. When a new subscriber joins your list, they are expecting to receive a message from you and most often open it! This means that your welcome email is incredibly important and deserves more than just a courtesy message thanking them for joining. It should provide them with valuable information and make sure they feel that subscribing to your list was a great decision. Your welcome email will set the stage for future message you send. Another benefit is that once you create the message, it will be sent to every new subscriber with ZERO action on your part. Be sure to update the subject line of the email from the default provided by Mailchimp. You want to make sure that every element of the signup process reflects your brand and voice. Next, change the content of the email. To help you find inspiration, think about email lists that you’ve joined in the past and what type of a welcome you received. To give you an example, the message below is sent to new subscribers for my email list. Note that I provide a great deal of value including links to blog posts. Additionally, I give them information about what to expect next. This approach increases their likelihood to open the emails they receive as part of the onboarding sequence that each new subscriber receives. Don’t worry if you don’t have your welcome email text perfected. You can always update the information as you study best practices and develop your skills. TEST!! Once you have finished customizing the signup process, it is essential to test it. You want to be sure that the voice and branding is exactly how you want it. Pay careful attention to each step that your subscribers will experience and make any adjustments needed. Getting started building your email list can feel overwhelming. Start out with confidence by customizing the signup process for your subscribers to reflect your brand. By personalizing each step from a design and content perspective will help you stand out from others. Utilize the 3 steps provided in this article as well as the detailed tutorial video to get some Mailchimp mojo! This 4 page checklist covers each step in the article. 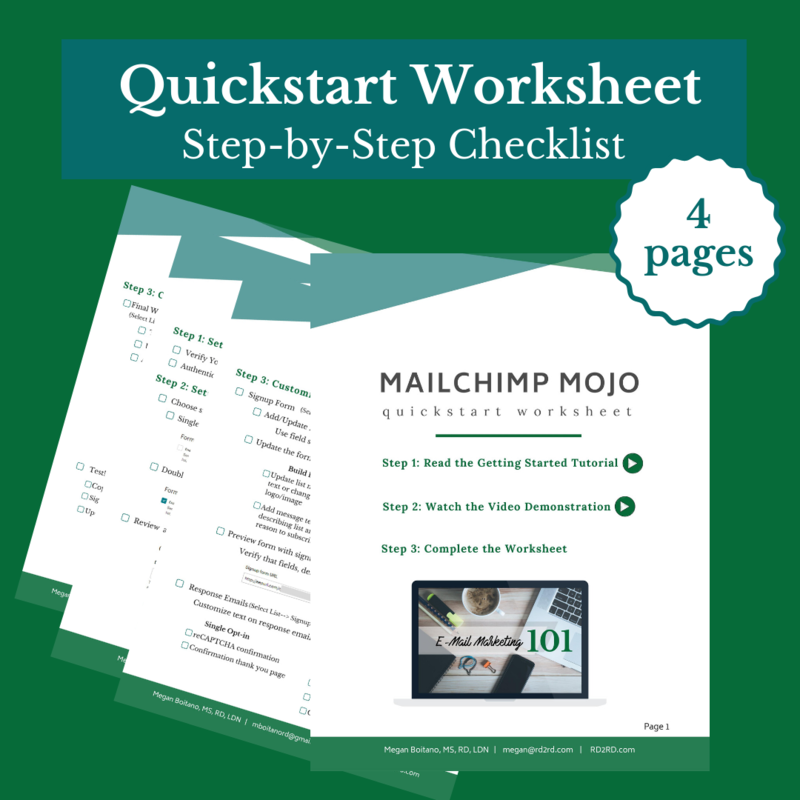 Stay organized with a step-by-step quickstart worksheet. Track your progress and be confident that your list is setup and your signup process is running smoothly. This site and the products and services offered on this site is in no way sponsored, affiliated, endorsed or administered by, or associated with, Mailchimp. Nor have they been reviewed tested or certified by Mailchimp. Mailchimp is a registered trademark of The Rocket Science Group LLC. The RD2RD Live Show featured 25 experts in 2018. It was nearly impossible to choose only 5. 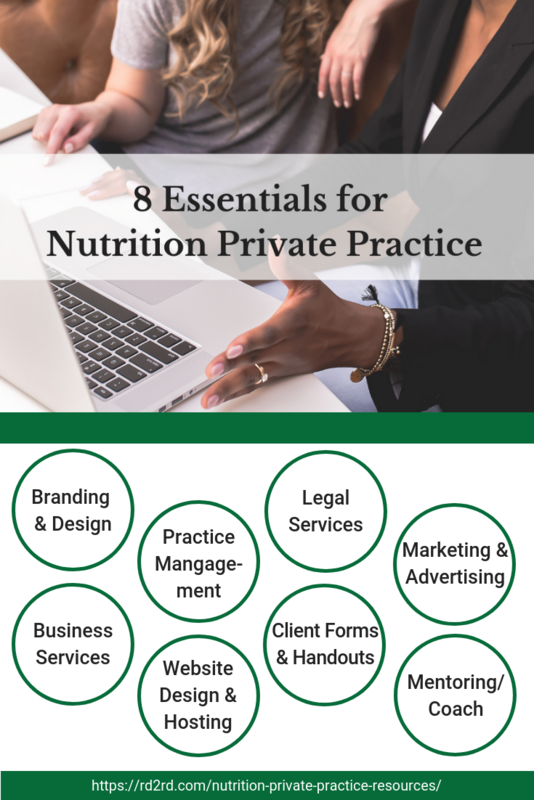 But, if you are a Registered Dietitian that wants to grow your business in 2019, these are MUST watch episodes. The episode has been the top watched of the year and sparked conversation about SEO tools and tips. During the episode Lara explains how she used keyword research to boost her website traffic from 6,000 page views per month to more than 250,000 in 6 months. In addition to explaining the steps, Lara shows the paid tool she uses to complete her research as well as recommends free tools that offer similar functionality. This show gives you practical actions you can take with no major financial investments to increase the traffic to your website by focusing on optimizing your posts for search engines (SEO). Whether you are a blogger or other business owner, this episode will change how you think about your content and website. Pinterest has the potential to drive significant traffic to your website, but just like any other platform, you need a strategy that gets results. In this deep dive, Chrissy gives a detailed overview of how to create a high performing pin. From researching keywords and writing an optimized pin description to creating an image for your pin, the level of detail and insight will leave you feeling confident. In addition to showing the key components of a pin, Chrissy also shows how to ensure your blog post is optimized for Pinterest including essential image text to use and explains the pros and cons of rich pins for recipes. To better explain these concepts, she gives a behind the scenes look at paid tools on her website. If you are looking to up your Pinterest strategy, this is one Live Show episode you don’t want to miss. 3. Grow Your Blog: Content Creation and Promotion Strategy with Leesa Klich, MSc, R.H.N. The process of blogging and promoting your posts across various social media platforms can feel overwhelming. However without a solid and consistent process for both creating new content and sharing it, you will be missing out on traffic to your blog. In this Live Show, Leesa simplifies the process and breaks down exactly the steps to take to make you blogging process organized and perform well. Leesa shows how to use one consistent process across your email newsletter, social media and blog. From what and when to post, this episode gives easy to implement action steps. If you want to get more organized with how you promote your blog post to your followers on social media and your email list, this is a must watch episode. As a blogger, you have the opportunity to market and sell products to your followers and site visitors. However, you may not enjoy the process of “selling” or how to approach. You are not alone. In this episode, Heather gives incredible insight into concepts related to attracting and nurturing the relationship with potential purchasers She also shares how she approaches marketing on social media and via email. As a seasoned online business owner and the creator of the extremely successful RD Entrepreneur Symposium, the opportunity to learn from Heather’s marketing wizardy is a no-brainer. If you struggle with getting “sales-y” or don’t know how to approach promoting products to your audience, this is a must-watch episode. As a blogger, you want to convert site visitors to your email list. However, figuring out how to create a lead magnet that is compelling enough to get visitors to provide you with their email list can be hard. In this episode Orly talks about some key concepts that will help you create a high-performing lead magnet. From getting crystal clear on your target customer to figuring our where your audience “hangs out” you’ll find this episode will help you figure out what to offer that will get visitors on your list. This episode also digs into the topic of how to write compelling copy. However, as important as the lead magnet is the words you use to present it. The episode gives tips on how to identify and use language that will resonate with your audience. If growing your email list is a priority, this episode will get you feeling clear and confident on exactly what lead magnet to use. Selecting only 5 episodes was very difficult. These episodes should be on your watch list as well. Click here to access to video library for all RD2RD Live Show episodes. The RD2RD Live Show is a biweekly learning series. It is utilizes a live Q&A format and is broadcast via live stream to the RD2RD Marketplace Facebook page. Questions from viewers are encouraged and can be asked in advance or during the live event. 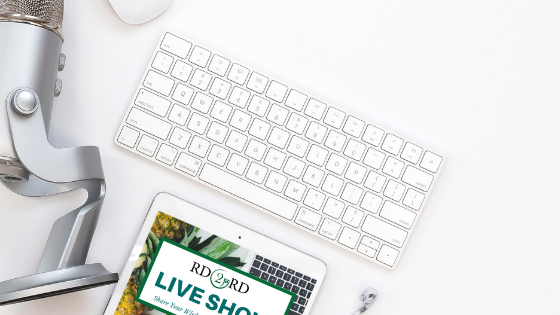 To be notified of show topics and dates, join the RD2RD email list and follow the RD2RD Facebook page. A list of upcoming events can be seen here. Show recordings are available in the video library as well as on RD2RD’s YouTube channel. Gutenberg, the long awaited upgrade to WordPress is here. The traditional page and post editor you’re familiar with has been replaced by block-based editor. This new block-by-block building style is more modern, but you may find yourself struggling to create posts and pages. Want to see what you’re in for when you upgrade? 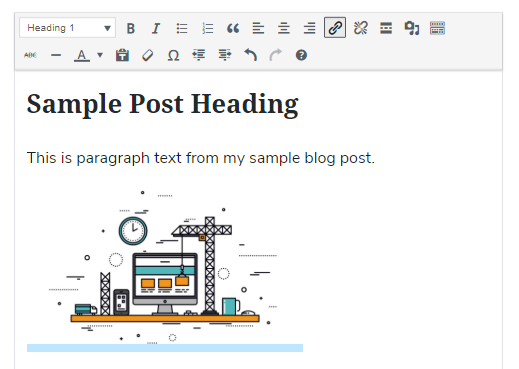 Get a look at the new block approach to creating a blog post. 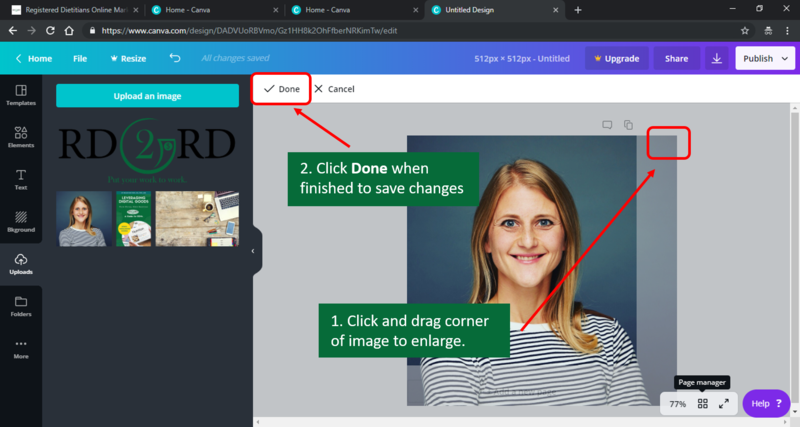 This article includes a video demonstration as well as a detailed look at the new page builder. View the video embedded for a walk-through of how blocks work when creating a post. Gutenberg is the new WordPress builder for pages and posts. The classic editor you are familiar with has been replaced with a new and more modern tool. 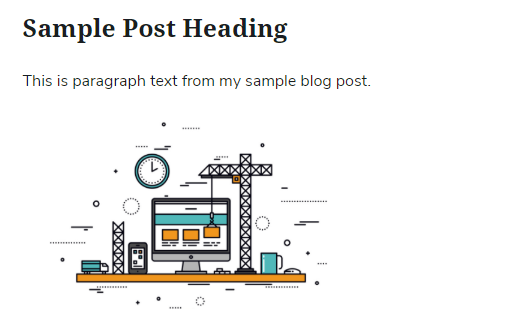 Instead of creating posts and pages using what feels like a text box and making edits to individual elements of your post or page, each element is built using blocks. For example, you would previously select text and change it to a heading. With the new editor, you choose the header block and then add your paragraph text. The result is nearly identical to what you created with the classic editor. 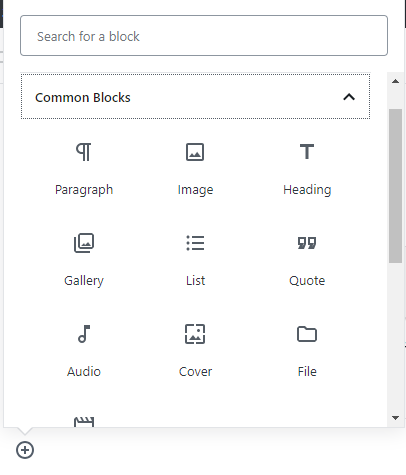 When creating a page or post using Gutenberg, you will choose a type of block to add and then the specific block. 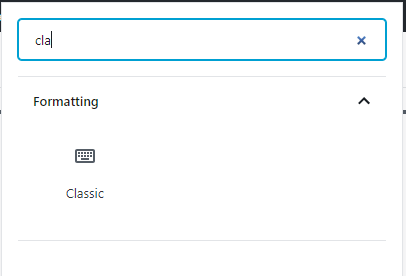 You can browse by category or use the search feature. Paragraph text, quotes and images are all added using blocks. For a full description of each type of block, visit this article. Depending on the plugins you have installed, you may have additional blocks available. 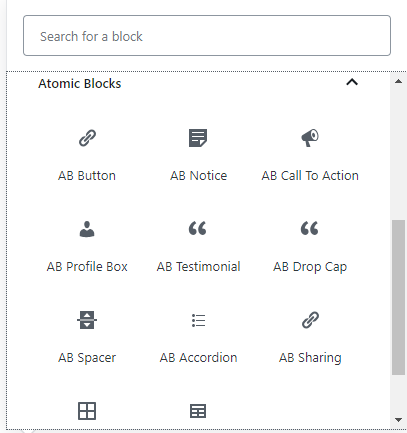 For example, the Atomic Blocks plugin for the Atomic Blocks theme (FREE) gives you a custom set of blocks to add to posts and pages. This is an example of the Atomic Blocks (AB) Call To Action. With Gutenberg, it is easy to build a post or page from individual blocks and create a visually appealing product. The ease of using blocks to build pages and posts makes for a different, but improved experience. For example, there is a block to easily add a button to your page or post. There is a learning curve with using the blocks, but the format is fairly intuitive. If you are familiar with using SquareSpace, this new editor will feel very familiar. Once you have added a block, you can move the block up or down with a hand drag tool or arrows. This makes it easy to rearrange content. To make additional changes to a block, you can access settings for each block. Click the three dots after selecting the block you wish to edit. When adding a new block, you can easily specify if you want the block positioned above or below the current block or at the end. There is also a convenient “Classic” formatting block you can add if you want to go retro and create a post using the older look and feel. The new builder has been in development and testing for a long time. A great deal of time and effort has been put into modernizing WordPress’s core page builder. You can stick to classic, but once you give the new builder a try, you might find that you have no plans to return. One popular option with the prior WordPress builder was to use a third party page builder. The WYSIWYG (what you see is what you get) drag and drop approach has long made it easier to create appealing pages within WordPress. 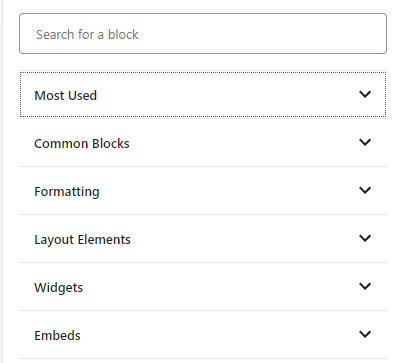 Here is an article about Gutenberg that addresses page builders like Divi and Elementor builder. Gutenberg represents the future for WordPress and significantly modernizes the approach to posts and pages. 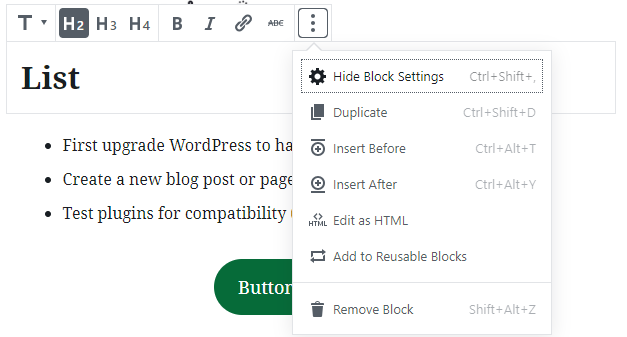 Upgrading the latest version 5.0 or later of WordPress will give you access to blocks. You can always revert back to the classic editor with the available plugin. You want to create a digital product, but what you really want is a PROFITABLE, digital product. 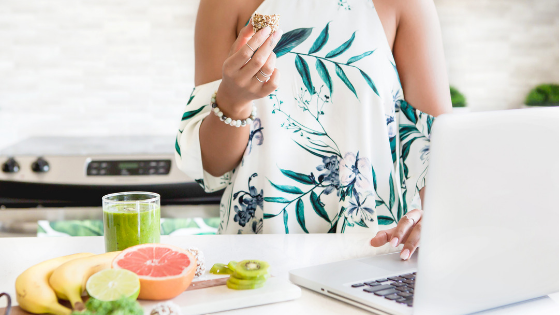 As a Registered Dietitian, you have countless ways to monetize your expertise and generate passive income selling digital products. The hardest part can be deciding what to sell. 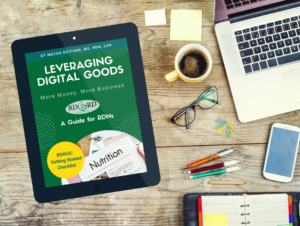 In this article you’ll find 5 different types of profitable, digital products well-suited to Registered Dietitians. Examples of each product type will get your creative juices flowing. You’re sure to be full of ideas when you finish reading. Get ready to launch your profitable online store. The most popular type of digital product you can sell is an ebook. It is easier than ever to self-publish a book. If you consider that more than 30% of sales from the Kindle store are self-published, this product type should be at the top of your list. If self-publishing isn’t something you’re ready to take on, traditional publishing is still a viable option. Keep your eye on the trend of the hybrid author, an author who publishes both via traditional publishing and self-publishing. A large investment isn’t needed to get your book idea off the ground. One of the benefits of a digital product is the low cost of producing the product. The largest investment will be your time. If the thought of selling your book gives you more pause than the writing, take heart. Setting up an online store is easier than you might think. Selling from your own website allows you to keep more in earnings than selling on a site like Amazon’s Kindle store. Generate sales of your book by promoting it on social media, linking to your book in blog posts and online groups. You can also sell your book on a marketplace website like RD2RD. If writing hundreds of pages has you feeling overwhelmed, the length of many ebooks is shorter than you might imagine. There are many examples of short ebooks available. You might see them called guides. Don’t be afraid to start small and get your product launched more quickly. When reviewing, note the difference and price and length between these products. 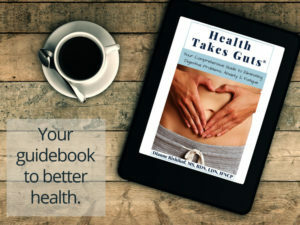 Health Takes Guts: Your Comprehensive Guide to Eliminating Digestive Issues, Anxiety and Fatigue – This book is sold as a stand-alone resource, but also has a pricing option that includes 13 treatment protocols. 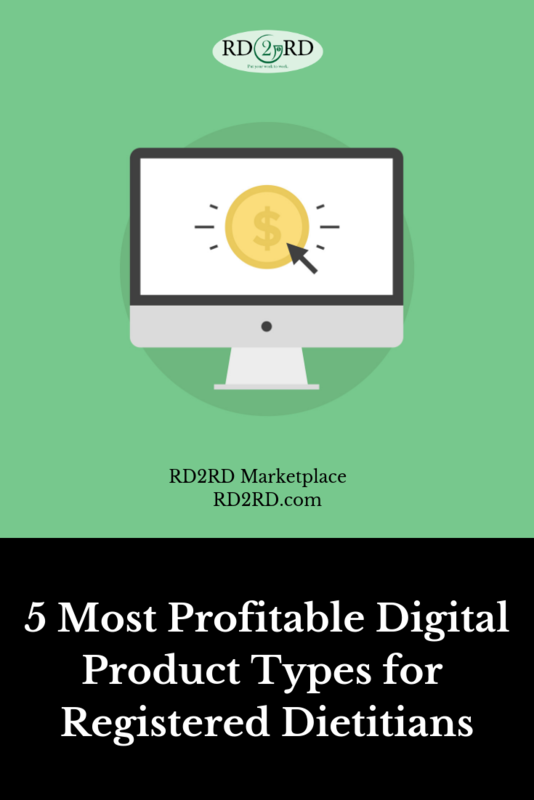 Having pricing tiers and a strategy for up-selling can boost revenue from your digital products. 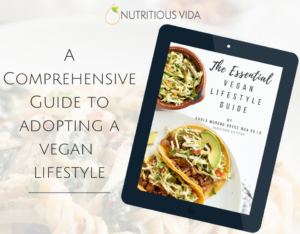 The Essential Vegan Lifestyle Guide – Note this product is called a guide, but is organized like an ebook. It is comprehensive and substantial in length. Keep in mind how you name and market your product as it can be valuable for sales and pricing strategy. A Primer on Ayurveda for Health Professionals – This book is an example of a creating a product in a specific niche and monetizing expertise. It is also sold on Amazon as a physical product and this digital edition. You may want to offer a physical book as well. Sports Nutrition for Peak Performance – This is a shorter and more economical option than the other books listed. Think about how you could offer a product like this to your clients or promote in related blog posts as a more comprehensive resource. The boom in online learning has created an opportunity to monetize your expertise as an RD. Some course creators choose to create content aimed at clients or the public, while others create resources for professionals. Most online courses feature video lessons and many also include downloadable resources with purchase. Some courses allow access to all lessons immediately after purchase. Others make content available over a period of time, an approach known as “drip” content. Creating and selling an online course is a big project, but it allows you to create a passive income source. Typically online courses have a higher price tag than other digital products. This article features RD course creators and how they choose the method to sell their course. 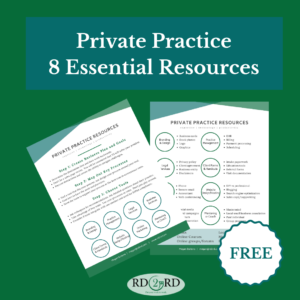 Private Practice Education: On-boarding Your Client – This educational video offers insight into a complex and confusing process for new private practice owners. The video provides best practice recommendations and includes references to other digital products available such as policy templates. This is an excellent example of cross-selling other products to existing customers. 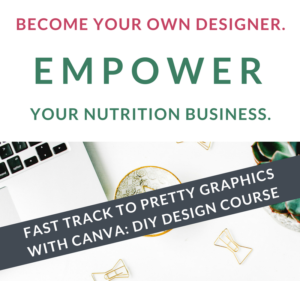 Fast Track to Pretty Graphics with Canva – This course is aimed at nutrition business owners that want to improve their graphic design skills. It is an example of creating a digital product that leverages skills not traditionally thought of as within a RDs expertise. You can monetize expertise outside of the narrow definition of nutrition. 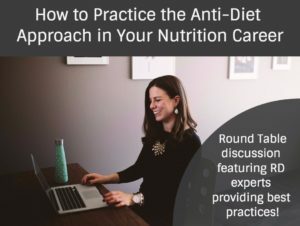 How to Practice the Anti Diet Approach to Dietetics – This includes both a recording of an expert panel-discussion style webinar and a workbook. The video was previously a live event that was transitioned to a recorded, on-demand digital product. The addition of a workbook or download can increase the value of a course or video. 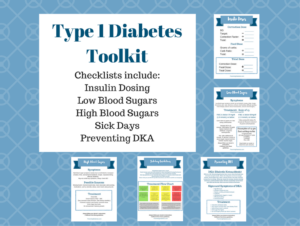 Documents can include items like handouts, meal plans, forms, templates or toolkits. You may have already created a number of documents for your own use that could be easily put to work earning you passive income. Selling documents you’ve created is an efficient way to jump into the world of online sales. Typically, you’ve validated the use of these products in your own practice or business. This means you don’t need to spend a great deal of time to get them ready to sell. You can easily sell your documents directly from your website. There are a number of considerations when you are setting up an online store. 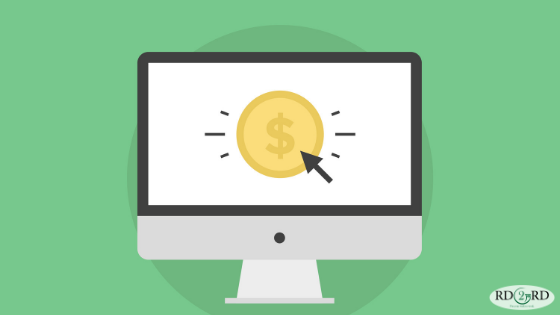 This article provides an overview of key elements of selling online. Many sellers opt to use a marketplace to sell their digital documents. 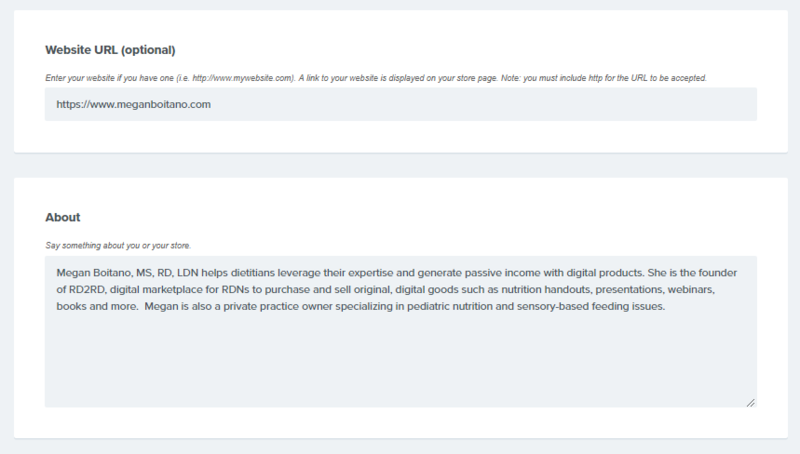 RD2RD is an example of a marketplace designed exclusively for RDs. A benefit of a market place is help to market your products to a broader audience and increasing sales. Fitness Dietitian’s Initial Consult Questionnaire – Forms are an essential part of running a nutrition practice. This is an example of a niche-specific form and a way to create passive income selling a tool you have already created. 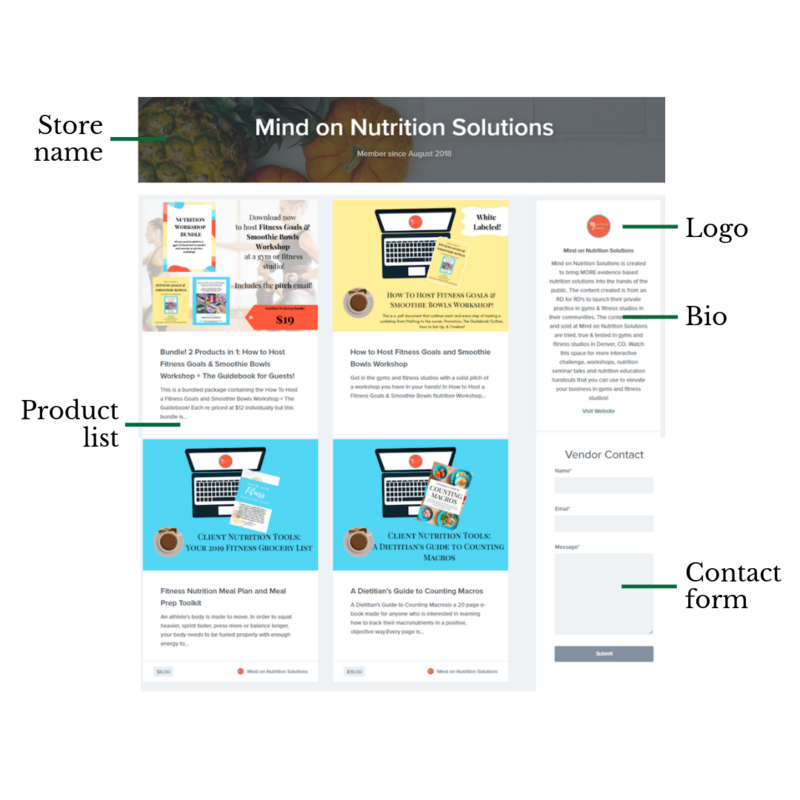 Low Potassium Plate Guide – This client education handout leverages the creators nutrition knowledge, design and education skills to create a passive income digital product. 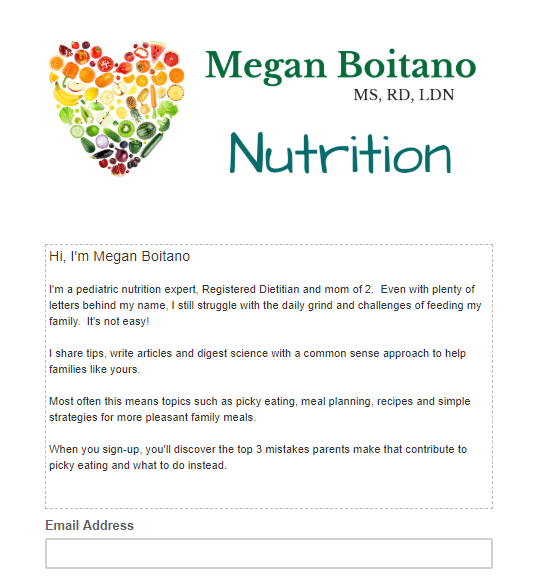 A visually-appealing handout that reviews an important nutrition topic, is always in demand. Easy Peasy Simple Snacking Guide – An organized and visually appealing list of 40+ snack ideas – this resource fills a common need RDs have when working with clients. Tools that are helpful in your practice can also earn you passive income. 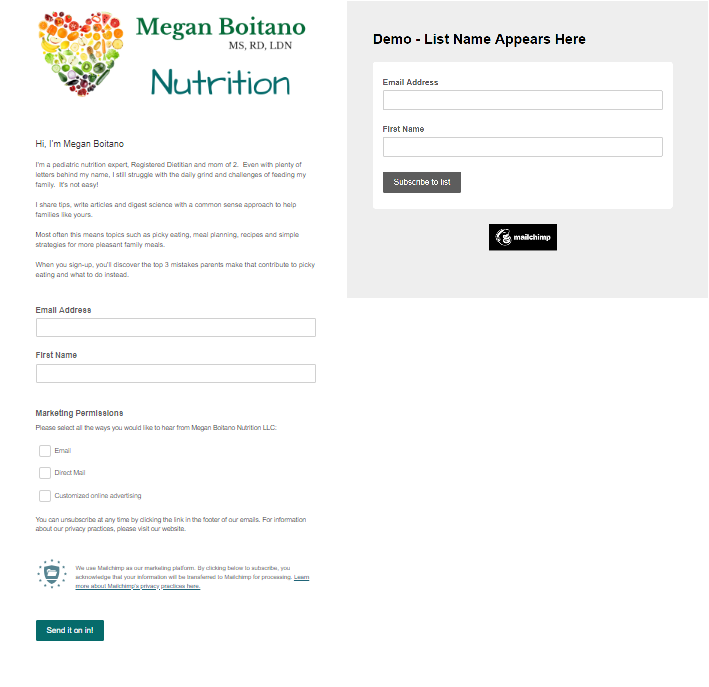 Dietitian Reimbursement Toolkit – This product contains a combination of videos, forms and templates. Offering a comprehensive toolkit can increase the value for the customer and price point of the product. You may not think of a service as a digital product, but they can be a profitable way to earn money online. You’ve probably heard of or used sites like Upwork or Fiverr. These are marketplaces where you can easily hire a freelancer for jobs such as designing a logo or creating a video. These sites also allow you to sell your expertise as a service. Services can also be included with other digital products that you offer in a bundle. 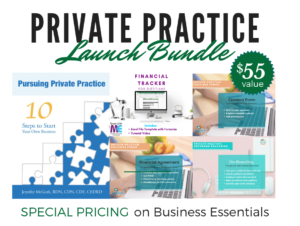 For example, you may offer access to a video and workbook at one price, but also have a higher price tier that includes a custom meal plan, virtual visit or customization. Services that are well suited to RDs include writing, recipe analysis/development and menu planning. If you have skills in areas such as graphic design, website building, food photography or other niches, you can also sell your expertise as a service. Guide to Freelance Writing as an RDN – This is a comprehensive getting start guide for RDs that want to generate income writing. It is an example of a digital product in a service-related area for RDs. Recipe & Food Video Planning Toolkit– This toolkit contains a set of tools to help plan and execute recipe videos. Creating high quality food/recipe videos can be a income-generating service for RDs. Sales of images and graphics have increased dramatically. While there are free stock photography websites, purchased images and graphics are common. If you have skill in developing appealing health and nutrition related graphics or photography, you could sell them as a digital product. Typically, with graphics or images, you would be granting the purchaser rights to utilize your work under a licensing agreement while you retain the copyright. 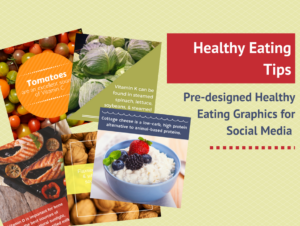 Healthy Eating Tips for Social Media Graphics – these pre-designed healthy eating graphics for social media leverage design skill to create a digital product. Fruit Character ABCs – these printable characters are an example of using design and education skills to create a passive income digital product. Selling digital products is an incredible opportunity for Registered Dietitians to monetize their expertise and generate passive income. Selecting a profitable digital product that is well-suited to your skills can help you quickly launch a profitable online store. 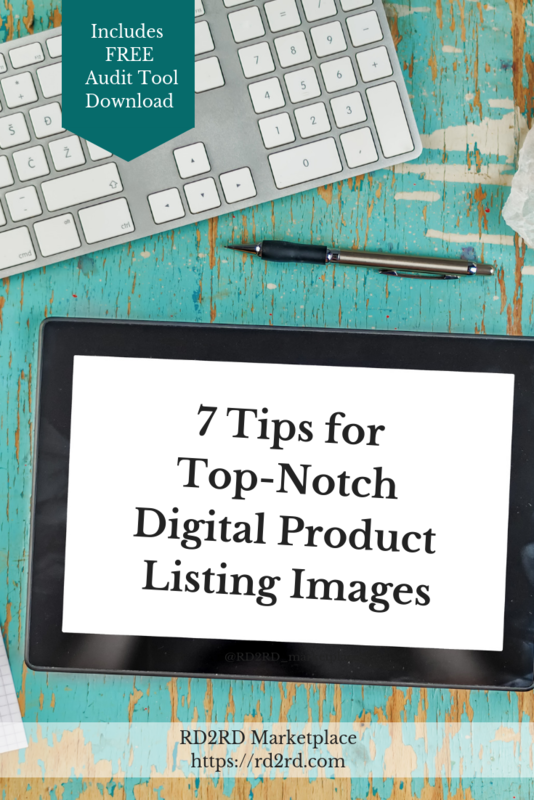 A top-notch digital product listing image is an essential element for a successful product. You must capture the attention of your customer and create motivation to click on your product to read more. More clicks is more opportunities for sales and income. It isn’t necessary to hire a graphic designer or have access to expensive design tools to create a listing image that helps your product stand out and generate strong sales. By following a few key principles and avoiding common mistakes, your product image will be an asset to your product and your pocketbook. A listing image template provides a number of benefits. Having a consistent design, colors and format for your listing images makes the process more efficient. Once you design your template, when you create new products, you can simply update product-specific information. For your customers, a template increases brand recognition. It is easy for them to identify your products. This is especially beneficial if you sell your products on marketplace websites such as RD2RD or Etsy. 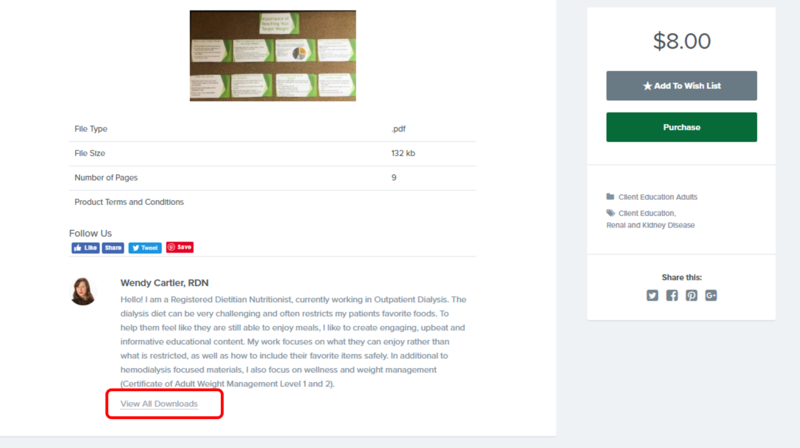 Below are examples of RD2RD vendors that utilize a consistent template for their listing images. You can see how this approach creates an easily recognizable brand and also makes creating the image more efficient once the template has been created. Karla Moreno-Bryce from Nutritious Vida. One of the challenges for both online buyers and sellers is that you can’t physically touch or examine the product prior to purchase. A digital mock-up helps to bridge this gap and give customers the ability to see the product prior to purchase. A digital mock-up could be an image of pages of your handout fanned out on a desk background or shown on a tablet. The customer can immediately recognize what the product is and gauge the quality of the content. A digital product listing image needs to be eye-catching. The image will likely be the first thing that people see when shopping online and if your image doesn’t stand-out, you’ll miss out on clicks to your product and sales. Visually appealing digital product listing images use a combination of color, text and images to create a cohesive design. To find design inspiration, browse online sites such as RD2RD, Etsy, TeachersPayTeachers and Amazon. Once you have identified inspiration images, break them down into individual elements such as text, color, background and digital mock-up. Your listing image should function like a billboard. For your target customer, it should be immediately recognizable that it is a product for them. If you are selling a book or printable, it should be obvious at a quick glance what the product is. In many cases, your listing image will be the only part of your listing that customers see. For example, Google displays images in search results and people click based solely on the visual. Your digital product listing image should contain enough information about your product to “stand-alone” without your written product description. When you think of it like a billboard and to capture attention and encourage the customer to click and read more information, you will drive more traffic to your product and generate more sales. Text (if included) should support the product’s purpose and catch the attention of the customer. Think of your own experience shopping online and what captures your attention. Most likely, you are first drawn to a stylish image and note a few keywords that capture your attention. You the decide to click on the product and read more information. It is not necessary to include the complete title of your product on the digital product listing image. You may choose to use a keyword or even ask a question? Your goal with your product listing is to capture the attention of your target customer. A background image can set the stage and help to capture your customer’s attention. For example, using a background image of a cutting board with fruits and vegetables makes a statement about your product and adds visual appeal. A picture of a professional desk and computer would make a completely different statement. For background images, you can take your own photos or utilize free or paid stock photography. One tip for finding images is to include the search term “background.” Typically, you are looking for images that have space to add a digital mock-up or page image. Your listing image will likely need to be a specific height and width. Typically this information is specified by the online marketplace or shopping cart platform you are using. 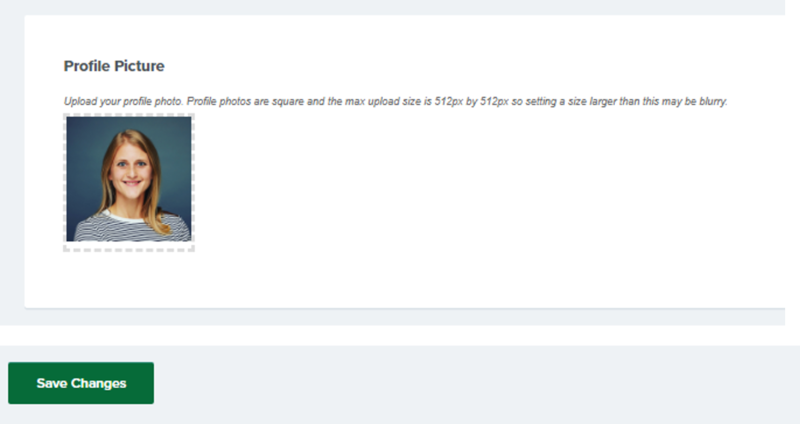 The image size could be landscape, portrait or square. Not using the correct dimensions for your product listing images will result in parts of the image being cut-off and an unprofessional visual for customers. This will greatly decrease your product sales. For RD2RD, listing images dimensions are 930 pixels wide by 700 pixels high. Creating a custom sized image can be done for free in design tools like Canva or in paid tools like Photoshop. For more, watch this detailed video tutorial on how to create a custom sized image with Canva. 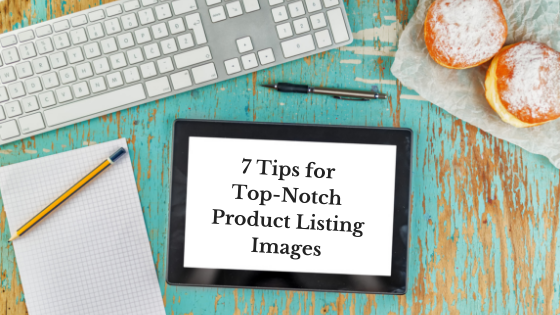 Take time to design a top-notch product listing image. Use a high-quality background image to capture the attention of your customer and speak to the product type and content. Include a digital mock-up to show both the quality of your product, but to also peak your customer’s interest and generate a click for more details. Avoid too much text and think of your listing image as a billboard with a focus more on keywords and capturing attention. Want to find out if your listing image is optimized. 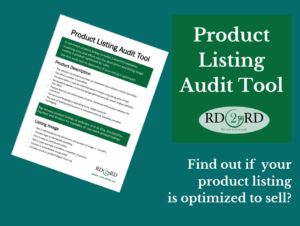 Download the product listing audit tool and use it to assess your product listing image and product description.